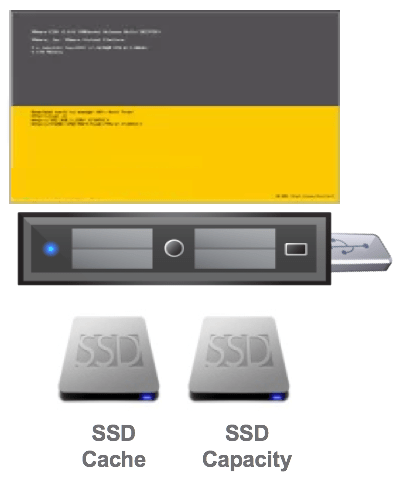 In addition to the hardware where the SDDC will be deployed to, the only other physical component that is required is a USB key that is at least 6GB in size and I recommend a USB 3.0 if you can which will definitely speed up the deployment compared to older versions. The content and the layout of the USB key is also something that I have also fully automated. Yes, I have a script that automates the automated installer 😉 We will go over that in greater detail in Part 3 when we take a look at how to actually consume this in your own environment. Once our USB key has been prepared, then the last step is to simply plug that it into your system and power it on. This is where you go get a beer or 5 and come back ~45min later. For those of you that are interested in the details, there are two phases of the provisioning phases which is described below. The first thing that happens is the ESXi Installer boots up and loads our Kickstart configuration file. 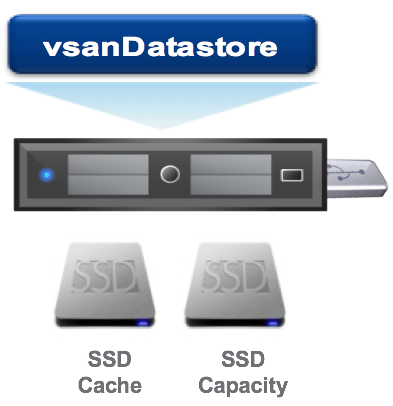 It then executes a %pre section which goes and identifies the two free disks and claims them to bootstrap our vSAN Datastore. The script can handle both Hybrid as well as All-Flash configuration and this is configurable setting within the Kickstart file. 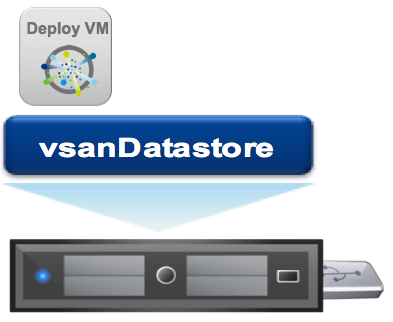 Next, it copies the content from our PAYLOAD partition onto the vSAN Datastore and encodes the specific configuration into the DeployVM which we will be used in Phase 2. 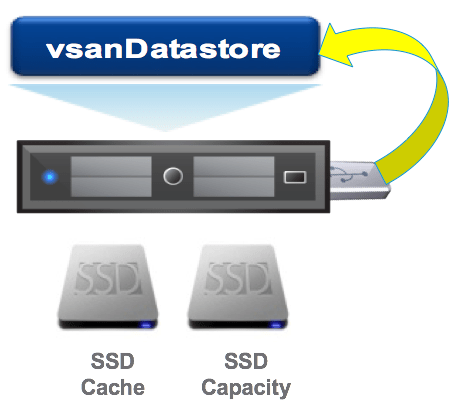 If we did not copy off the content, when ESXi goes and installs itself onto the same USB key, our PAYLOAD partition will automatically be wiped. Lastly, ESXi is then installed and finishes up by executing a few configurations in the %post section of the Kickstart and the system reboots. Once ESXi boots up, there is a %firstboot script which runs and registers our DeployVM that we had copied earlier and it also powers it on automatically. Within the DeployVM, there is a startup script (rc.local) which automatically runs after 60 seconds. This script then reads the encoded configuration that it had received from the Kickstart script using guestinfo. 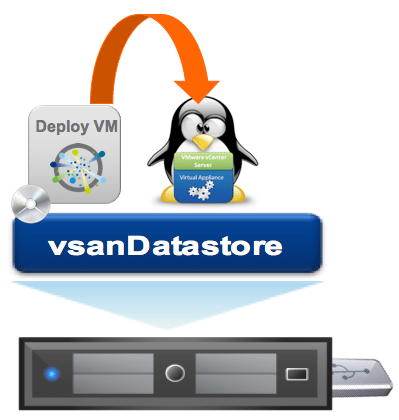 * properties and uses that info to create the vCenter Server Appliance (VCSA) JSON configuration file. The JSON file is then passed to the VCSA CLI Installer which then initiates an automated deployment of the VCSA. 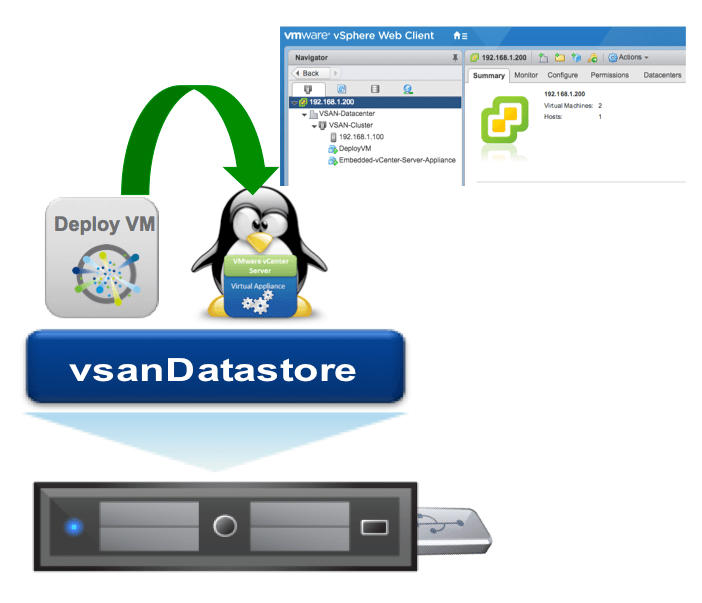 Once vCenter Server is up and running, the rc.local script then runs a vSAN Management SDK for Python script which setups the vSAN Cluster and enables Dedupe/Compression (applicable to All-Flash vSAN configuration only) on the pre-created vSphere Cluster based on the encoded configuration the user had provided in the Kickstart. Lastly, PowerCLI-MP is launched via a Docker Container to finish up the vCenter Server configuration which includes adding the physical ESXi host into the vCenter Server that we had just deployed. 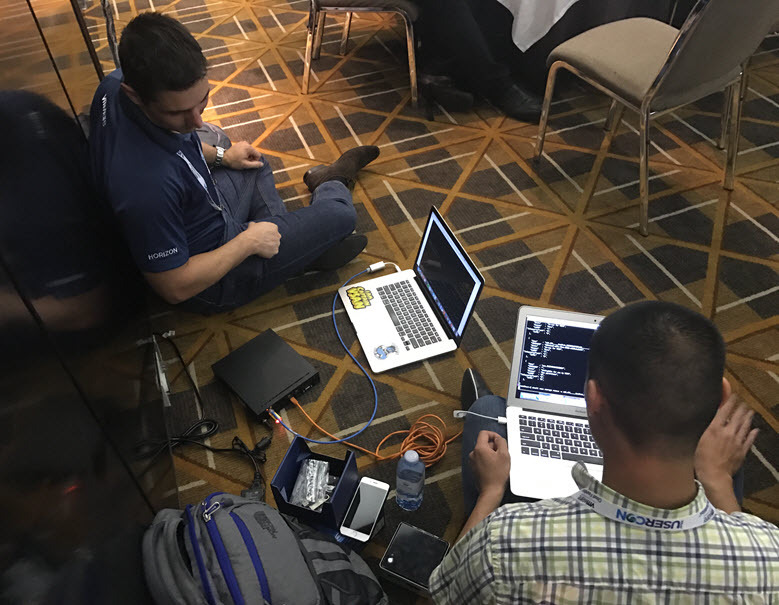 The reason we had to use a couple of different tools is that not all of the vSAN Management APIs are currently available as part of PowerCLI-MP and though we could have kept it all in one language, our initial goal was to rely on PowerCLI-MP for the majority of the work and then use other tools if necessary. Hopefully in the very near future, we will have parity between PowerCLI for Windows and PowerCLI-MP so this could be further simplified in the future. Lastly, what has been described here is really just one way in which you can deploy the environment. This example works very well for a completely isolated environments where you do not want to rely on any external dependancies. In practice, this solution may be more restrictive since the code and binaries are pretty static. Another method in which could be implemented is to have the binaries and even the code to be centrally stored say behind a simple HTTP server. Some generic bootstrap code could run in the DeployVM which would then pull this script remotely which would include instructions on what to do based on some pre-defined rules for the admins. Perhaps this will inspire other folks to come up with other creative solutions, just thought I give you some food for thought. In Part 3, we will finally get our hands on the code, I know you are probably anxious but I felt it was important to provide some background on how the solution work before jumping straight into the solution even though it is pretty straight forward to use. 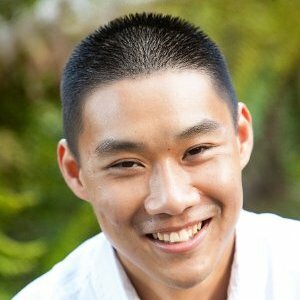 hi william, absolutly great article. when will part3 available?. 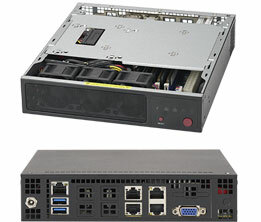 hope that my hp ml110 also can get this auomated deploy of this cool environment.